DC made a wise call in cancelling Super Sons and then quickly re-starting it as a miniseries. There is really not much that is different between this book and the previous series. Robin is still an obnoxious jerk, and Superboy is still a charming idealist. They have repaired their destroyed base, and are spending their summer vacation together while school is out. But this is all occurring at some nebulous point in the future. It had to be, otherwise there would be massive continuity problems with the current storylines in the Superman books. Tomasi is far too good at writing this book for it to simply end just because Jonathan Kent is off travelling the universe with his mother and Jor-El. Bringing the book back as a miniseries set after Jonathan’s return to Earth neatly avoids plot problems, and really isn’t any sort of spoiler. I knew he would be back eventually. Besides, in this issue we wind up meeting a host of junior versions of classic DC villains, all aliens who have come to “play” with the young heroes, and who will undoubtedly be the enemies that they face as the miniseries plays out. The story has all the energy and humour of the previous book. Indeed, aside from switching from an ongoing to a limited series, nothing much has changed, and that’s a really good thing. 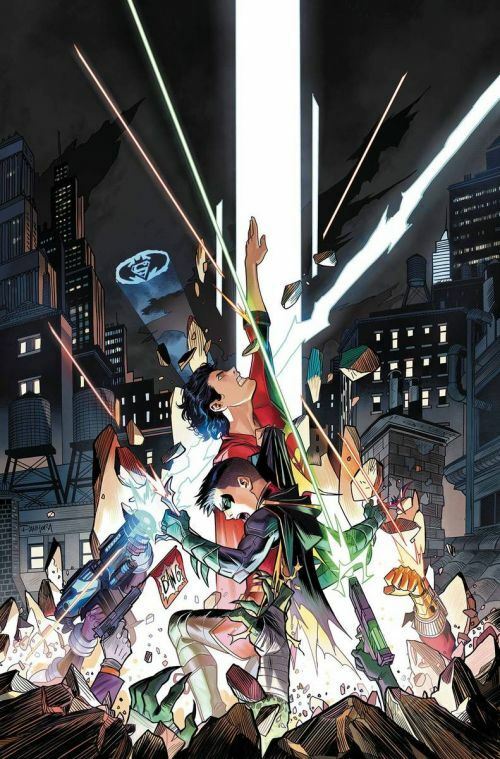 It’s funny and frenetic, and exactly what I want from the Super Sons.